Questo cottage romantico situato sulla storica 'Arca Row', ha un ambiente tranquillo e sereno, con una bella vista sulla baia. Il cottage si trova in città per il suo molo privato sull'acqua. Non è 'vicino' l'acqua, né semplicemente una 'vista' l'acqua. Cada un ciottolo un molo ed è spruzzi in acqua. Leggere o scrivere, cenare o osservare una sfilata di vita marinara: barche a vela, pellicani immersioni, e le guarnizioni curiosi. Anche se dieci minuti il ​​Golden Gate Bridge e 15 minuti dal centro di San Francisco, sarete nel vostro mondo appartato. Nel corso della Marin County ci sono favolosi bike e sentieri escursionistici con kayak e barche disponibili a Sausalito. Il mini ambiente di Sausaiito marittimo è da tempo riconosciuta come il tempo più temperato nella Bay Area - fresco d'estate e tipicamente nebbia libera la maggior parte dell'anno. So quaint and perfect for a person or a couple. You can walk everywhere. Definitely coming back. I am pleased to learn that Marni and Jeff enjoyed their visit, would be happy to have them stay here again Marion. We are repeat visitors at this wonderful location. What more can we say. So convenient, central, yet quiet and picturesque. The host is delightful and we are repeat visitors so what more can we say. These nice people have stayed at the cottage before, and are favorite guests of mine. I appreciate their kind comments, and am pleased to know they were comfortable. This site was just as described online. We used this location as our place to rest our heads at night. It was perfect for that. It’s within an easy walk of the San Francisco ferry and multiple restaurants. We had easy and free parking for our car, but a truck would work too if needed. It’s a one bed unit with shower. Kitchen space includes a stove, microwave, toaster, necessary dishes and pots, and a mini fridge. Water pressure was great. Mattress was very firm, which my husband really appreciated. There is an outside table to sit and watch the water fowl and sunrise. There are bars a couple doors away but we were never bothered by noise. It was warm the first few nights and the windows don’t open. So we had to sleep with the doors open. Luckily we had no intruders of ANY kind. If you use wash rags I suggest you bring some. Towels were very soft. The place was clean. Despite it backing up to the owners Home, we found it very private and quiet. If you want a new, trendy or spacious place to hang out for hours, this may not be your place. But if you want convenience and functionality, this is perfect. I appreciate the positive comments made by these guests, they did not seem to realize that the 300 sq ft deck and deck furniture at the side of the cottage was part of their rental, I have re introduced face cloths to the linens provided. Lastly the cottage is a separate building not attached to my house. Geat! Comfortable, clean and convenient! Marion was an awesome host and the place had everything we needed! It made our 21st anniversary special! We will return for sure! I appreciate the kind comments made by these guests, I. would be very pleased to have them stay here again. What a lovely little place to stay in Sausalito! We had an amazing time at 515 Humboldt; it was the perfect place to stay right in the heart of town with easy access to dining, shopping and visiting the sites of San Francisco, Napa, Muir Woods and the list goes on. Marion was the perfect hostess providing us with a clean, nicely decorated and comfortable abode for the week. It is important to point out that this is not a houseboat...so no rocking back and forth on the water. Instead, it is more of an efficiency, really; a small separate structure back behind Marion's home shown here. Nevertheless, it was directly on the water and we would definitely stay there again and again because of the privacy, the setting and the convenience. It really was so comfortable and cozy-made for an incredible vacation! I appreciate the review that these guest left, they were exceptionally nice people, its good to hear they enjoyed their stay and I would be very pleased to have them as my guests again. Marion's directions were perfect and in no time we had made our way through the gate and into this lovely bungalow. The bed was comfortable and the location was quiet - just as we had hoped. 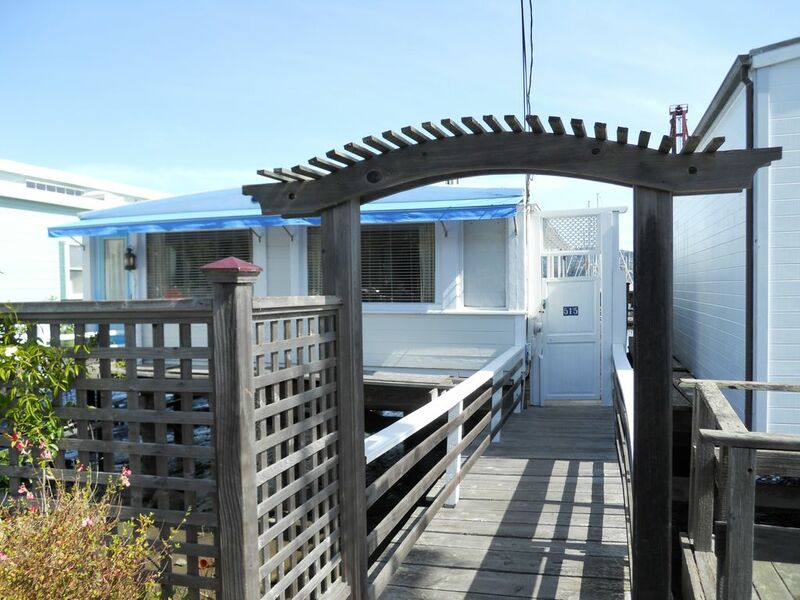 The location is very convenient to downtown restaurants, the SF ferry, walking and bicycling paths, local beaches, etc. The location is ideal for a 2 person getaway. It is small but the charm and location more than make up for the size. On receipt of your deposit I will send a confirmation and directions to the cottage.